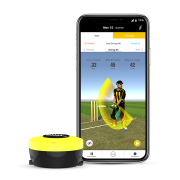 The revolutionary new digital batting cricket coaching aid from Kookaburra and Stancebeam. Allows forward thinking cricket coaches to record data from a batsman on to an App on their Smartphone. Can pick up shot accuracy, bat swing speed, alignment and many more key features. A must for any cricket coach working on a bowling machine or in one to one cricket coaching.